Please join us for an exhibition of vessels and jewelry pieces by artist and jeweler MJ Tyson. Opening reception May 5 from 7-9pm, artist talk June 10 at 2pm. 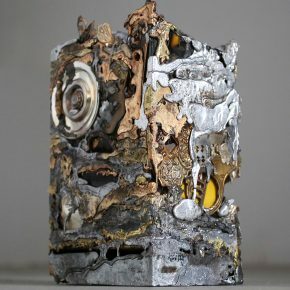 MJ Tyson’s work is centered on the relationship between people and their possessions, and makes use of unconventional casting, re-use, and record keeping. 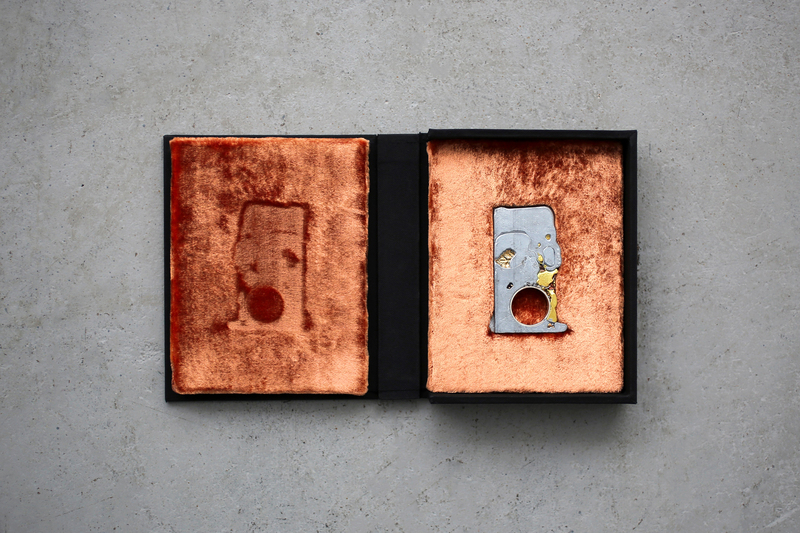 The Last Objects features works from two main series: boxes from Inheritance and Dust to Dust, and vessels from Homes. Each work is comprised of personal objects left behind by deceased residents, sited at specific locations, and named accordingly. Looking into works like 102 Garden Hills Drive gives the viewer a glimpse of this past and offers the opportunity to reconstruct narratives with the remnants. All material carries a past. Whether we acknowledge this lineage or not, it exists. It may be to our advantage — as a way of orienting ourselves in our world — to consider the cycles of creation and destruction intrinsic to the objects that surround us. Our individual lives are fleeting. We use objects to extend ourselves beyond the boundaries of our bodies and lifespans. We ask these objects to lend us immortality, and we practice collection, conservation, and restoration to that end. In reality, nothing is immune to change. Objects also die. Embracing the destructive side of creation, MJ Tyson practices the reincarnation of personal objects. The resulting jewelry and vessels hold evidence of their past lives within their new forms. These are messy situations in neat packages, ready to go back into circulation. The last objects will become the next. MJ Tyson is an artist and jeweler from New Jersey. She received her BFA from the Jewelry + Metalsmithing Department at Rhode Island School of Design in 2008 and returned to earn her MFA in 2017. Interests in value and material culture have led MJ to the worlds of art appraisal and museum conservation. Research in these outside disciplines informs her studio work.